Fletcher Cox on the Eagles sideline after getting injured against the New Orleans Saints during the teams' January playoff game. 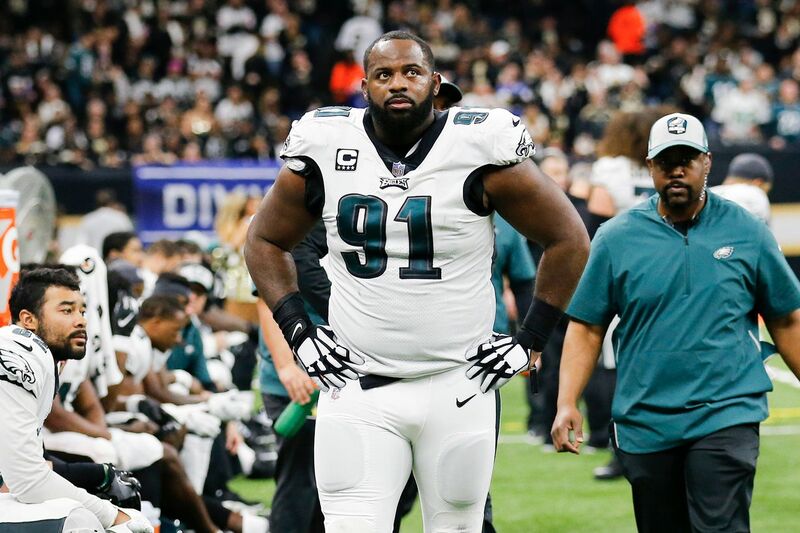 Fletcher Cox said Tuesday that his goal is to be ready for training camp after undergoing “a procedure” for the foot injury he suffered in the Eagles’ Jan. 13 playoff loss at New Orleans. Cox left New Orleans wearing a walking boot and was wearing the boot in early March, when an ESPN.com report referenced the surgery. He was out of the boot and walking normally Tuesday, the second day of the Eagles’ offseason conditioning program. That was despite not enjoying as strong a presence next to him at the other defensive tackle spot. Injury limited Tim Jernigan to three games, and Beau Allen left in free agency last offseason for Tampa Bay. Replacements Haloti Ngata, Treyvon Hester, and Bruce Hector were easier for opponents to handle than Jernigan and Allen were during the Eagles’ Super Bowl season in 2017. This spring, Eagles moved to help Cox by signing Jacksonville free-agent defensive tackle Malik Jackson to a three-year, $30-million deal. They also might address the position in next week’s draft, which is said to offer exceptional defensive-line depth. Cox said he and Jackson are “going to spend some time together. It’s nothing that can happen overnight. It’s just things have gotta build during the season. Him being next to me, me learning how he plays, him learning how I play certain things, how he rushes and how I rush, is going to take some time. Eagles defensive tackle Fletcher Cox leaving the field after getting injured against the Saints. The last few years, the Eagles have put the likes of Michael Bennett or Brandon Graham next to Cox on third and long, but Jackson, listed at 6-foot-5 and 290 pounds, probably won’t come off the field in favor of a defensive end. This offseason, the Eagles dismissed defensive-line coach Chris Wilson, Cox’s position coach at Mississippi State, and replaced him with his Eagles assistant, Phillip Daniels, a 15-year NFL playing veteran. Cox indicated the change was not a problem for him.